Martin Slofstra • Toronto Sun • October 13, 2018 – Town’s mayor wants people to stop, have a look and not just drive through. 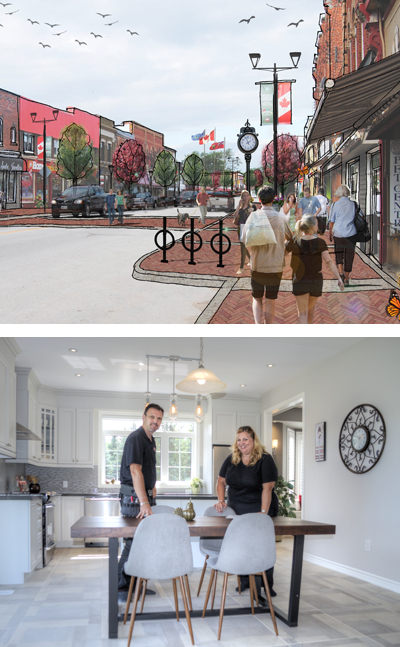 For a small town, Stayner has lofty ambitions. I recently spent 90 minutes with Mayor Chris Vanderkruys on a walkaround of the downtown area. This friendly town located just minutes south of Wasaga Beach and Georgian Bay is about to get a huge makeover. We pop in and out of stores on the town’s main street — an art gallery, a clothes store, the local coffee shop and neighbourhood Home Hardware store. I meet shop owners all who are only to happy to chat — everything is quintessentially small town Ontario — but things are about to change. The downtown area looks a little tired and probably could use a shot of energy. Mayor Vanderkruys, however. is one step ahead of me and ready to discuss. But not one to just take his word for it, he wants to show me. Planned changes to the main street area are extensive and include wider sidewalks, curb bump outs and cobblestone crosswalks. For the stores, it’s façade improvement, and the addition of modern design elements including enhanced lighting, pedestrian corridors and better parking on side streets. As for the busy highway 126 that now runs through the downtown area, it will be narrowed to two lanes. The whole idea, says Vanderkruys, is to entice people to stop here and not just drive through on their way to someplace else. An example is Thursday nights this past summer when the town hosted a combined Farmer’s Market/Music and ‘Park It’ night. Vanderkruys says that when people see this type of activity, they’ll be inclined to stop and join in. Clearly, the goal is to get the small town feeling going all the time, and the downtown revitalization is the project that will catalyze it. Current projections are the full build-out will occur over the next four to six years. “It will depend on funding,” he says. Fueling the town’s plans is its growth, Stayner’s population is 4,200 but that could easily double in the next five to 10 years. Getting people to live here and attracting new business is part of the strategy. So too is welcoming new home builders to the area, most prominently, MacPherson Builders which will be building the majority of new homes. The builder itself seems eager to add to its reputation for developing comfortable, low-rise residential communities in small town Ontario, and can point to past successes in Collingwood and Fergus. Phase One sales of its Nottawasaga Station. Phase One of Nottawasaga Station consists of 69 bungalow, raised-bungalow and two-storey designs. 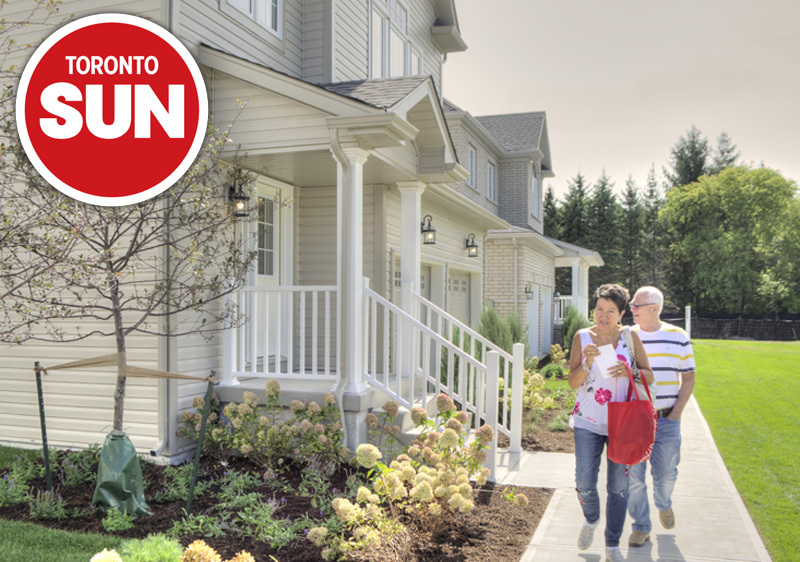 The two to five bedroom homes range in size from 1,355 to 3,200 square feet with prices starting at $439,900 for singles on 45’ lots and $502,900 for homes on 50’ lots. My tour of Stayner included a visit to these model homes, and you can immediately see the difference from a typical new home site in the GTA. The lots are substantially bigger and so too is the distance between homes. The feeling of more space continues inside, and includes roomy kitchens with choice of custom designer cabinetry, generous islands and extended breakfast bars. Also in view are double stainless steel sinks; oversized mirrors and custom designer vanities in bathrooms. The implication is clear, these are much larger homes and yards, and at much lower prices than the GTA. But also, and a big part of the sell, is the quality of life in the surrounding area. Stayner is close to Georgian Bay, the Niagara Escarpment, the Minesing Wetlands and has convenient access to Barrie to the east, GTA to the south and Wasaga Beach/ Collingwood to the north. When it comes to sustainable living, Stayner is no slouch, and the Clearview Trail Link will be a network of recreational trails of interest to hikers, bikers, and outdoor enthusiasts. Stayner is also just down the road from Clearview Eco Park, a public green area which features trails, interpretive signs, a dog park, and a bird view of the over 200 different species that migrate to the area. A tree planting held on the day of my visit to the park shows the town is committed to the environment while displaying a good level of volunteer spirit. The park will also feature a community garden that will among other things provide fresh produce to the local food bank. On Sunday, it’s a visit to the local fall fair where activities include bouncy castles, axethrowing and a pie and chili contest, and to my surprise, admission is free. The small town feeling is again evident everywhere, and with a downtown renewal plan firmly in place, the town just needs to get down and make it happen.